At Macadam Floor And Design, we know that the kitchen is one of the most important rooms in your house, and nothing makes a bigger impact than the counters. 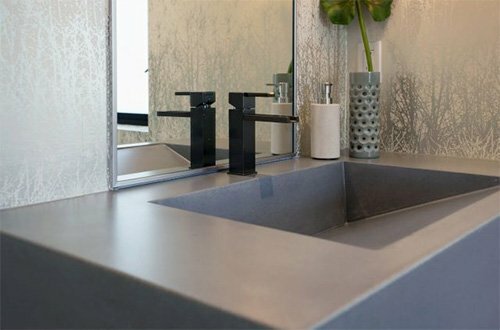 A slab countertop offers unparalleled durability and beauty in a wide range of colors, materials, and finishes. One-of-a-kind markings, ease of cleaning, and the durability of natural stone makes this a great choice for your kitchen. Granite is used most often, but soapstone, travertine, quartz, and slate are also common. Marble is unmatched in its stunning beauty. The subtle veining helps disguise wear and tear, and with proper care, you will love its elegant look for years to come. A wood slab countertop will create a warm, traditional feel in your home. When sealed properly, these countertops are ideal for food prep areas. Rock maple is the most commonly used wood, but you may also find beautiful surfaces made of walnut or cherry. These countertops may be constructed of long strips, short blocks (a butcher block), or wide planks of wood. Glass is growing in popularity as a nontraditional countertop material thanks to its clean, modern look. It’s a great option for customized designs because it can be cut into any shape, size, or texture. As long as it’s tempered and is at least an inch thick, your glass counter will be strong and durable. Concrete slab counters are usually prefabricated and reinforced with wire mesh or rebar. They can be highly polished and, once cited, are extremely sturdy. These slabs are both attractive and eco-friendly. Typically they are made of recycled materials such as concrete, plastic, glass, and paper. They may also be combined with some new materials. The biggest attraction of a slab countertop is the lack of grout lines that you find with tile. Grout lines break up the appearance of your surface and also trap food and dirt, making a slab counter more streamlined and easier to keep clean. Macadam Floor And Design is dedicated to providing you with the best service at all times. Our in-house design team will help you from start to finish, whether you’re remodeling your entire kitchen, or just want to match a new counter to your existing style. Call or visit us today and see why we’re the best to help you through the process!